An unwritten rule in car culture dictates that in order for a car to be truly remarkable, it has to have forgivable character flaws that give it a unique personality that allows man to truly bond with tamed machine. It is exactly those traits that make this car, the Aston Martin V8 Vantage, the best used exotic car value on Earth. The 1980s were arguably a difficult time for Aston Martin. The prestigious British car manufacturer was financially in dire straits, which prompted a deal with Ford in 1988 to ramp up production of their premium fleet and distance themselves from the likes of the polarizing Lagonda earlier in the decade. This allowed them to make room for the beautifully sculpted DB7, designed by none other than automotive virtuoso Ian Callum in the early ‘90s. Although The DB7 was a quantum leap forward, cementing Aston Martin as an automaker with perhaps the most beautiful car proportions in the world, the flagship model was still based on Jaguar’s XJS platform, which would be nearly three decades old when the last DB7 rolled off the production line in 2003. The solution for Aston Martin was to pour their resources into a new, bespoke, and modular platform known as VH, which stood for Vertical/Horizontal, terms that had more to do with marketing than actual engineering dimension of the cars. Over the next three years, AM released the V12 Vanquish grand tourer, the DB9 as a successor to the uber-popular DB7, and the car that was arguably the best handling sports car Aston Martin has ever made: the Vantage. Now that our history lesson is over, here’s what it’s like to drive. The Aston Martin V8 Vantage is a sports car designed by Henrik Fisker, originally meant to compete with the likes of the Porsche 911 Carrera S. It featured a 4.3 liter V8 engine derived from Jaguar’s AJ line, with different cylinder heads, cylinder bore dimensions, intake and exhaust plenums, and a race-inspired dry-sump oiling system that allowed the engine to be mounted further back than any other Aston Martin to date, essentially making the drivetrain a front-mid configuration. It was Aston Martin’s entry-level sports car, and a model that would go largely unchanged in platform for the next decade. The Vantage’s V8 topped out at a respectable 380 horsepower at 7,300 RPM and 302 lb-ft of torque at 5,000 RPM, which propelled the car from zero to 60 mph in 4.7 seconds, on to a 175 mph top speed. The Aston Martin V8 Vantage is a refreshing departure from what would be considered a normal exotic car. While it lacks the needy attention-grabbiness of a Tron-themed chrome Lamborghini or a red Ferrari that holds your bank account hostage, the Vantage treads the line between old-school sports car and elegant exotic at a price that is affordable by nearly anyone with a moderate rainy day fund. My car, for example, a good condition 59,000 mile example from 2007, cost me a grand total of $36,000, and it wasn’t necessarily an outlier in the market. In addition, unlike most cars with an original price tag that surpassed six figures, it remains one of the most maintenance-free cars in this bracket. Things like oil changes are more-or-less regular procedures and repair intervals are infinitely more reasonable than the likes of big V12 Lamborghinis, with their 5,000 mile, $12,000 clutch replacements. Although bespoke panels for Aston Martins can be hugely expensive if damaged, keeping a good Vantage on the road isn’t much more financially taxing than what would be required of a garden variety Lexus. Instead of adding the lion’s share of improvement over previous models to specific components, Aston Martin eked tiny incremental improvements from every aspect of the car to make the whole of the ownership experience more engaging and a truly novel event, even if the car is given the very achievable task of being driven daily. Its doors, instead of being plebe-spec curb-scrapers or gaudy folding scissor gullwings with dodecahedral hinges, are instead angled slightly upward to allow for street clearance and give an air of sophistication that would evoke an approving nod from every monocle-wearing baron that sees you asking for directions on how to get the hell of their equestrian society. The proportions that made the DB7 so evocative are ever-present in the Vantage, with every angle of the car being borderline pornographic, due in large part to the adherence to the golden ratio, a universal proportion that predates recorded history as a sign of purity. Contrast this theme with Aston Martin’s newer DB11, where the design language shifted to more of an aggressively angled mass that has more radical opinions about it than the 2016 Presidential election. From my perspective, even the later, more powerful iterations of the Vantage became increasingly aesthetically inferior to the original, as the company seemed to chase improvements to style that simply didn’t need to exist. Adding the fins and louvers present in the 2017 version made the overall shape more busy and took away from the car’s flowing, timeless lines, at least in this hopelessly biased reviewer’s eyes. The form-over-function theme follows seamlessly into the interior, with the wide-sweeping, back-lit gauges that function well, despite screwing with your mind by having the audacity to sweep backwards. The center waterfall, now standard in all Aston Martin designs, houses a flip-out, Volvo-era navigation that serves as little more than a visual reminder that you’re somewhere on the planet, two nondescript climate control vents and a prominent start button made of glass, which glows red when all required starting parameters are met. Yes, the car does have a traditional key lifted from an entry-level Volvo, but the action of taking your hand off the key to engage the glowing center mounted starter button makes the procedure of finally hearing that high-strung V8 roar to life that much more of an event. With the addition of an aftermarket Bluetooth music streaming receiver I fitted after buying the car, the system is just as modern as I’d want it to be, without having to hack the dash to install some ill-fitting touchscreen head unit that would go obsolete five seconds after I bought it. The V8 Vantage also includes everything in a wish list of anyone wearing a tweed jacket with elbow pads would fantasize about having in a sports car: limited slip differential, staggered tire sizes that aren’t so wide that you can’t break the tires loose easily on some gravel, sharp hydraulic steering and brakes that don’t know when to quit. However, that isn’t to say that it’s a perfect car. The build quality on some of the leather dash panels could be better, the seat lumbar controls are impossible to use while sitting down, the air conditioning controls don’t make any sense, and there is no physical indicator to see if your doors are closed or not. But as the Vantage is a hand-built British car, I’d expect these quirks and appreciate them as part of the user experience. There is, however, one major thing holding this car back from being the undefeated poster child of perfection that I imagined it to be when I hung an enlarged press photo above my bed all those years ago: the horrendous, unforgivable accelerator lag. In the late 1990s, car manufacturers switched from mechanical, cable-driven throttles to electronic, drive-by-wire throttles, mainly for more control over emissions and performance parameters. While this was a step forward on the technological plane, manufacturers with sports cars sometimes reverted to artificially hindering the potency of their pedals, for fear that their powerful and rev-happy engines would inadvertently land exotic car owners quite embarrassingly upside down and on fire. What this means is that on cars such as the Vantage with poorly mapped throttle bodies, a 100 percent pedal input would result in a throttle input that was significant less than wide open, and the lag between the physical press and the throttle doing anything would be worse than trying to play Call Of Duty online through a satellite signal connected to a cheap WiFi router that just so happens to belong to your neighbor. The Vantage’s taut suspension makes itself known at speeds befitting residential areas, but it’s a far cry from the spine-crunching ride you’d get in your usual race-prepped Nürburgring track special exotic. While this is on the firmer end of the spectrum, it’s infused with a tinge of the grand tourer DNA that defines its older sister, the DB9. During my 1,050 mile trip from New Jersey to Florida, the combination of suspension and one hell of a comfortable seating arrangement made it one of the most effective road trip cars I’ve ever driven. Letting the clutch completely out results in a smooth, Porsche Carrera GT-like constant four mile per hour crawl, making it extremely easy to manage for those that aren’t the most skilled with three pedals. First gear engages with a clunk similar to an BMW E46 M3, and shifting it around 4000 RPM makes it a little more lively to tool around town, if only to engage the vacuum-operated exhaust baffles that would have worked if only I didn’t bypass them to play residents in the neighboring counties the sound of my people. I’ll assume that many a journalist may disagree with me on this point, but the Vantage is one of the best aggressive driving experiences you can have without actually fearing for your life. Instead of a red line on the tachometer outlining when to upshift, the LCD in the center of the cluster has countdown tabs that flash when you get around the magical 7300 RPM limit, which is also where all of the engine’s 380 horses are released simultaneously. The torque, while not something that would put anything more contemporary to shame, is just enough to hold you in the well-bolstered leather buckets during hard cornering, which is exactly the point of this automobile. 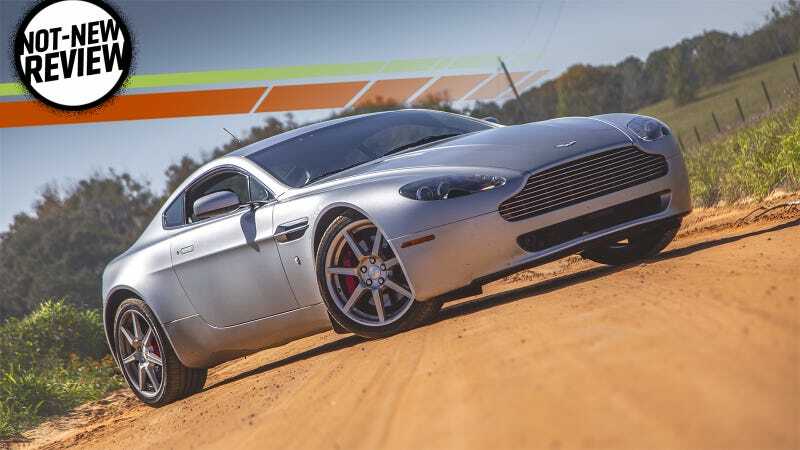 The V8 Vantage is not as much of a momentum car as a Mazda Miata or Toyota 86, but it’s long-legged gearing makes it possible for you to place your right hoof on the accelerator, weld your foot to the floor and not be in a pucker-worthy compromising situation before attempting to clip the next apex. While this car isn’t made for insanely twisty and technical canyon roads per se, it lives for long sweeping curves that last for miles with the engine’s revs screaming throughout the cabin, even if the driver skill doesn’t necessarily match the engine’s exuberance. The steering is perfectly weighted for higher speeds, with a deliberate lack of on-center twitch. It’s not something you have to actively think about, which is an underrated and welcome trait in contemporary steering systems on this sort of car. If you’re bold enough to hold the traction control button for the required 10 seconds to shut it off, controllable oversteer can be induced with a hearty stabs of the throttle. I wager a skilled driftsman could turn the rear Bridgestone Potenzas to a smoky-yet-mesmerizing blotch on Florida’s surprisingly well maintained backroads, but my last name isn’t Harris and hooning on that level would be well above both my skill and pay grades. And then there’s the sound. Unlike a Jaguar F-Type (which does have a derivative of this V8 engine), the Vantage doesn’t spit and fart its way down the street when you’re in get-me-to-the-supermarket mode. However, at the fun end of the tach, the sound coming out of the chrome tailpipes resembles that of a ‘40s-era Spitfire in full attack mode. It’s refined and controllable, with a slight tinge of the world is about to end. The aftermarket exhausts available for this car make it even more of a juvenile delinquent, and I look forward to installing some upgraded pipes in the near future, but the already goosebump-inducing sound of a bone stock Vantage at full tilt is something I can certainly live with. I’m willing to bet anyone else with fuel in their veins will find it quite acceptable as well. At the bargain basement price of $36,000, there aren’t many bona fide exotic sports cars that can compare, other than perhaps the 997-generation Porsche 911 and sixth generation Chevrolet Corvette. If you’re looking for an engaging driving experience, I’d have to give a slight edge to a Porsche 997 Carrera S, only because it beats the Vantage on usable power delivery and has handling characteristics that damn near break the laws of physics. However, it’s fair to say that the Porsche 911 will never sound as good as this Vantage, will never look as good as this Vantage, and will never surround you with bespoke materials that you know were put together by someone who might have had an argument with their spouse earlier that morning. I’m also sure a Corvette of similar vintage could thoroughly wallop the Vantage in the performance department, but the second you get into a C6, grab onto the likely pleather shifter and gaze at the steering wheel straight off a rental-spec Cobalt, you’ll grasp the folly of your ways. There is no other exotic car on the market that comes close to the overall value of the Vantage. While my car may have been scraping the bottom of the barrel, there are plenty of relatively low mileage, babied examples in the $40,000 to $50,000 range. It would be impossible to find a comparable Ferrari, Lamborghini, or hand-built anything for that price, barring perhaps a Maserati that only needs the quick job of removing the oak tree lodged in its rear quarter panel. Maintenance is reasonable, with synthetic oil change intervals at 5,000 miles, costing a grand total of $300 at the dealer, or around half that amount if you source the parts and do the work yourself like I did. The engine bay is accessible for repairs, and there are no convoluted engine-out procedures to change belts, although replacing a clutch can be a bit of a tough nut to crack for a home mechanic. It costs about the same to insure as my Mercedes S-Class, and other than having a inexplicably expensive windshield, it’s been quite gentle to my bank account. It does require premium fuel, but in real-world tests, it returns about 14 miles to the gallon in the city and 22 on the highway. On that front, it’s as not bad as it gets, well on it’s way to OK, I guess. It’s an automotive secret hiding in plain sight and it will attract no attention from those who know nothing about how awesome it can be, and that’s the point. It’s for the person that gets a little kick out of kids staring at the shape of the car through their backseat window, while their parents obliviously assume Ford Fusions now come in coupe form. It’s for the person that wants every desirable aspect of exotic car ownership without the marriage-destroying drawbacks. It’s for the person that understands unquestioningly that if you don’t look back after you’ve parked your car, you’ve bought the wrong car. The Aston Martin V8 Vantage makes all the right noises, it’s one of the most beautiful cars ever built and it’s at a price that can’t be ignored by those looking to scratch an automotive itch that was previously too big for their bank account. I had made my choice to purchase this car years ago, and despite knowing the adage “never meet your heroes,” this one was well worth the introduction.